Instructions: Take your Classic Petunia paper and cut 8 3.75 x 3.75 panels. You will then glue one of the 3.75×3.75 cuts on each side of the explosion box until all 8 sides are covered. For the top of the box cover you will cut a 4 x 4 piece of Classic petunia paper and adhere it to the top of the box. Once done you will need to cut 4 2 x 3.75 pieces for the sides of the top of the box. For the outside decoration of the box cut the decorative panels from the sheet of Classic Petunia patterned paper and adhere some foam tape to the back side of the paper. This will form a pocket that you put some memorabilia items in. Now affix it to one of the outside panels of the explosion box. For another panel fussy cut images from the Classic Petunia set as decor for the panel. Once this is complete add a total of 8 diamond embellishments from the package. Now to complete the inside of the box you will use the remaining 4 panels that you cut to decorate the inside of the box. 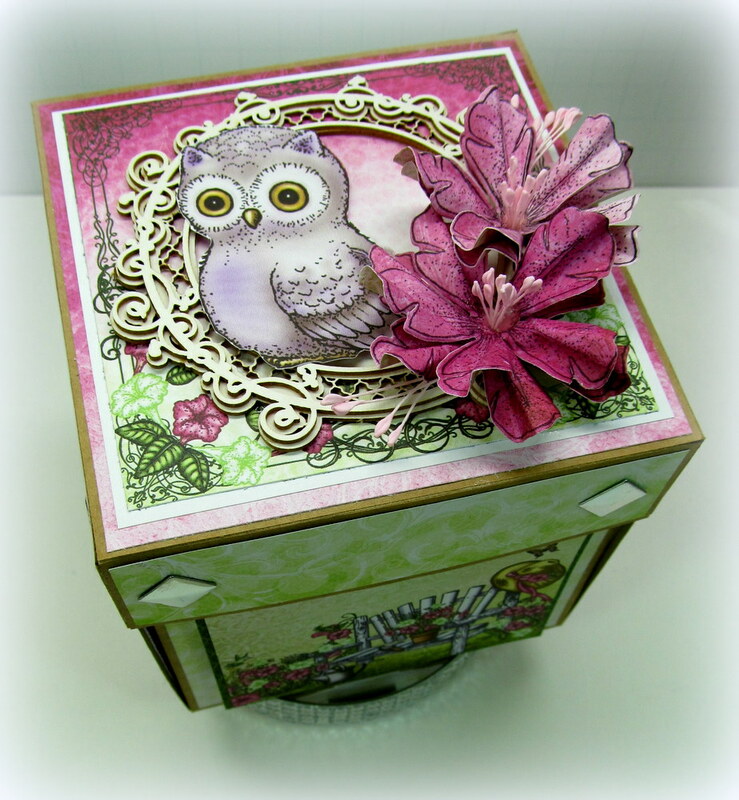 Here you will cut the image from your Sugar Hollow collection to decorate the inside of the box. You can add more elements from the patterned paper you have to decorate. To complete the top of the box you will need to stamp 4 medium size classic petunia flowers with your Memento Tuxedo Black ink. 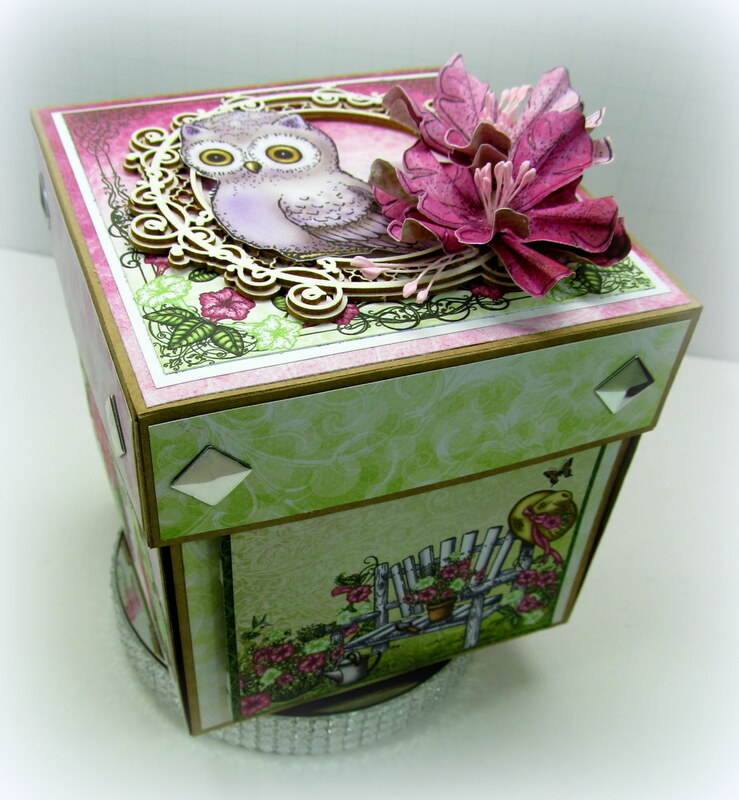 Once complete diecut with your Classic Petunia matching die. Use your Deluxe Flower Shaping tool to shape and mold the flowers and adhere together using your glue gun. Now use the stamens to decorate the centers of each of the flowers. 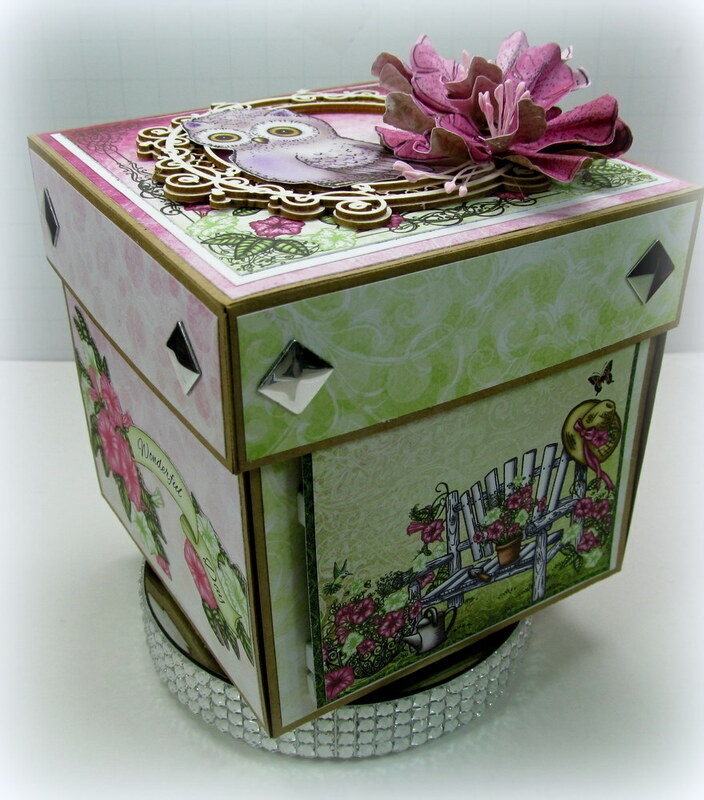 You will affix the Scrapiniec embellishment to top putting the flowers you made to the side decorating the top of box. 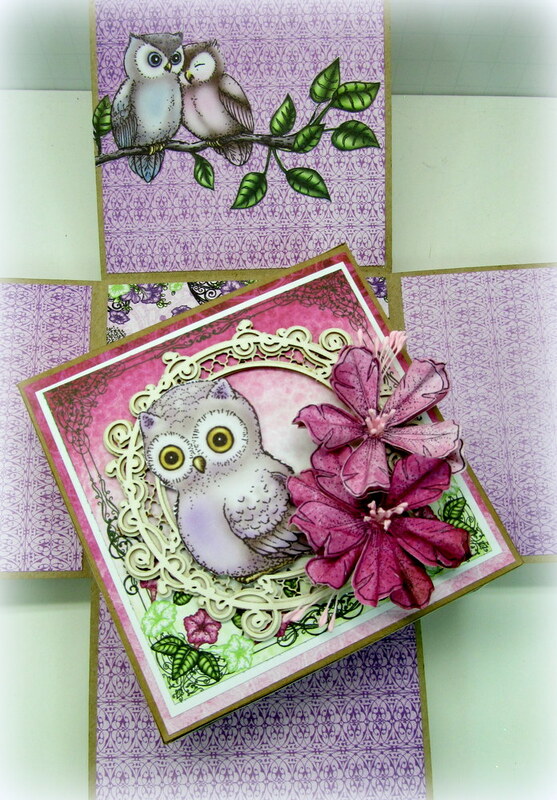 To finish it off fussy cut one of the owls from the Sugar Hollow collection to complete the look. I hope everyone enjoyed my post and thanks as always for stopping by be sure to leave a comment!